Available in all GAME stores. Good deal, GAME do an optional 2 year cover for £5.99 on top which even covers physical damage. Thanks, not sure if you can get the cover online but if you click and collect to store they can do it when you pick it up. Good deal for anyone with loads of reward points or gift cards. I'm holding out for a cool set for the last of us 2 (I can hope). Thanks Man, I'll take a walk down and trade a few bits towards one. 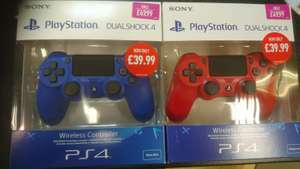 I thought the two new colours were launched other night already? Thanks, not sure if you can get the cover online but if you click and …Thanks, not sure if you can get the cover online but if you click and collect to store they can do it when you pick it up. The one at GAME on controllers has never given me any problems. Neither has their quid disc care thing, however, they are first party services from GAME. Extended warranties tend to be third party insurance company products sold on by a retailer. So infinite repairs but not replacement type stuff. The direct debit ones give you more power though. Deal posting newbie! This is Zombiehaddock first deal post. Help out by leaving a posting tip or just to show your appreciation for their contribution.